Sad news. It seems that a body discovered early Sunday morning is that of fashion designer Michele Savoia, who had been missing since last week. According to CNN, Savoia, 55, was last seen leaving Marquee, a Manhattan club, around 4 a.m. on Thursday. According to police, there is no apparent foul play, and the medical examiner will determine the cause of death. Savoia's body was found at 1:30 p.m. ET on Sunday in the water near his house boat, which docks at Pier 59 on the west side of Manhattan. Savoia's girlfriend spoke to the New York Daily News after learning of his death. " "I knew he was in that water. I am so glad they found his body," Juli Berg, 47, said. 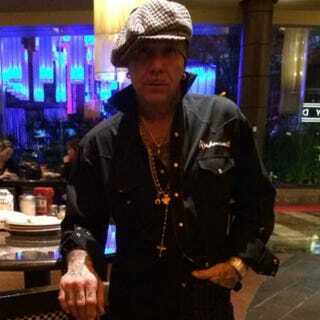 According to a Fashion Week Daily profile on Savoia, the designer, who they described as a "tattooed, needle-wielding daredevil (and FIT prof)" dressed celebrities including Robert De Niro, Mickey Rourke, Chris Noth and Matt Dillon. I was born in Hoboken, around the corner from Sinatra, so I'm a nice little Italian boy. My neighborhood was a cross betweenA Bronx Tale and Goodfellas. My father ran night clubs, and my Sicilian grandfather was a master tailor, who landed in Hoboken from Ellis Island in 1933. Basically, my father taught me how to dress, and Popop taught me how to tailor. He had his tailor shop down the block from our house, and I got kicked off to him every day. Before you knew it, I had a needle in my hand and was making patterns and sewing. I got into all kinds of trouble. I'm definitely the bad boy of fashion. Image via Michele Savoia Facebook.